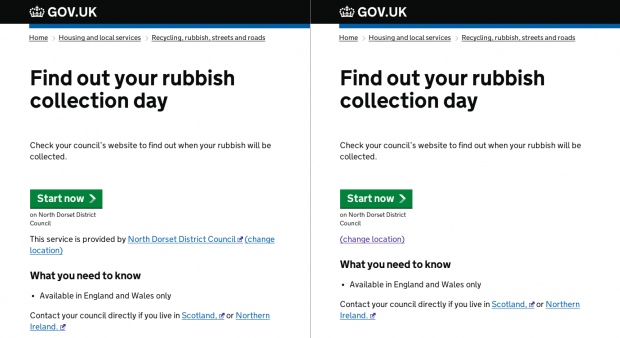 We’ve recently simplified the way we link to local services like Report a litter problem, Find out your rubbish collection day and many more. 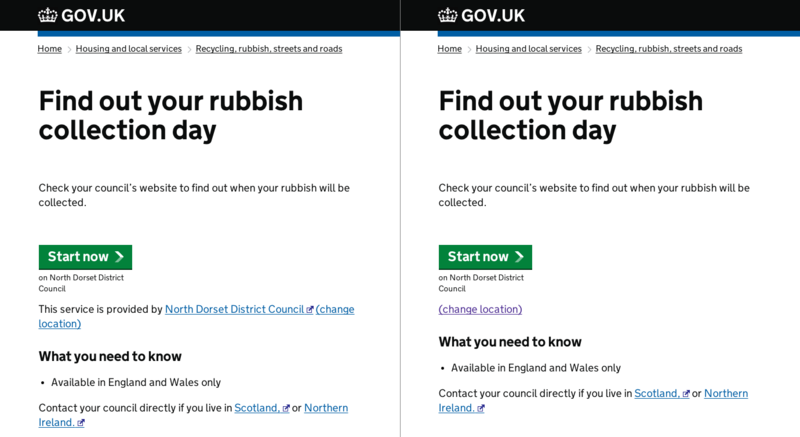 Our colleagues in DCLG got in touch to let us know that when users follow links from GOV.UK to local services, they're often frustrated to find themselves at the generic ‘contact us’ page for that authority. We’d also seen some feedback from users that suggested people were sometimes missing the big green ‘Start now’ button and hitting the name of council instead. The 'This service is provided by:..." link did seem to be the most clickable thing on the page for some users and wasn't adding anything useful. We’ve simplified things to remove that link, and we’ll be keeping an eye on feedback to see if this change helps people get to what they're looking for. So far as simplifying making sure people hit the big green button. But you've still haven't solved the main problem for people who understood how the system was supposed to work. e.g. I went to the "report a litter problem" link above. And just to test it i used your example. SW1A 2AA. And that gave me https://www.westminster.gov.uk/environment/streetcareandcleaning/ "Sorry we can't find this page". It's just so embarrassing for you. I don't mean to be rude. I've been in your position, so I know the messenger always gets shot. But when the team is asked to fix a problem, PLEASE. Fix the whole problem, not just half of it. I do think we solved (or at least improved) the specific issue we set out to improve here (users clicking an extra link, which always took them to a generic contact page rather than the specific service they wanted).